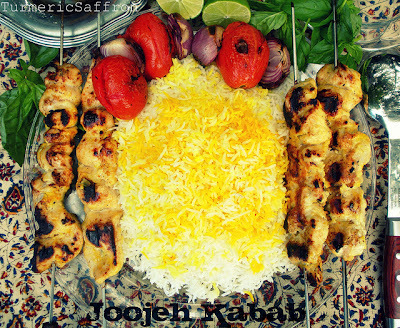 جوجه کباب Joojeh kabab is a simple, easy to make and popular dish in Iran and is most delicious when made with fresh and tender young chicken. Joojeh kabab is usually made with skinless and boneless chicken breast. However, it could be made with the whole chicken cut into small pieces, allowing ample marinating time, which is an important step in the cooking process. It's best to let the chicken marinate overnight for the best result. For a moist, juicy and flavorful joojeh kabob, marinate the pieces in a yogurt-based sauce with olive oil, lemon juice, grated onion, saffron and salt and pepper. Typical Persian joojeh kabab is not spicy at all and a little bit on the tangy side. In our home, we like our joojeh kabab more lemony and zesty. Grilled saffron chicken is usually served right off the grill with aromatic rice, grilled tomatoes and onions. 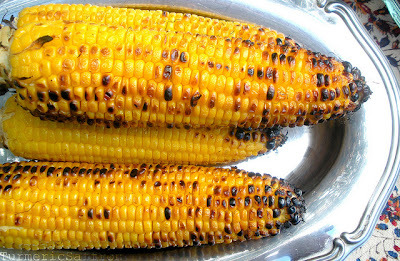 Also, grilled corn soaked in salted water would make a great side dish. I know it took me a long time to blog about this most delicious and well-known joojeh kabab recipe but I tend to mostly blog about the everyday kinds of foods I make for my family of four. The only reason for this long over-due post might be the fact that I am more of a savory soup and stew (ash and khoresh) kind of person and I don't make kababs frequently even though I do enjoy them very much. They are a taste from my childhood. In a bowl combine the yogurt, onion, olive oil, lime juice, liquid saffron, salt and pepper. Blend well into a smooth mixture, adjust the seasoning with lime juice and salt and pepper. Pour the mixture over the chicken in a large bowl, making sure that all the pieces are fully covered with the sauce. Cover with plastic wrap and refrigerate for 6-8 hours. Serve warm with rice, yogurt, salad, fresh herbs and pickles. Or, you can make a joojeh kabab sandwich with warm bread, lettuce, tomato and onion slices with a dollop of yogurt and cucumber dressing. Azita, I am utterly drooling looking at this food. I made lubia polow earlier this week, it was so good. I love Persian food! I have make joojeh many times and never ever get tired of it, it is truly a wonderful meal. Now I have a new version to try, thanks for sharing. Wow, this sounds like a wonderful specialty kebab with saffron, I would love to try it! 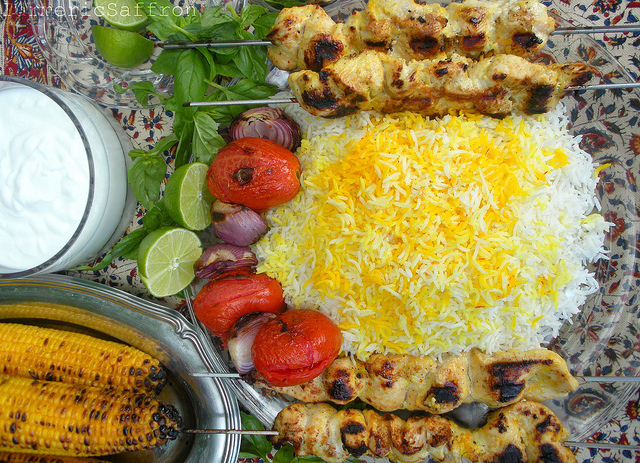 I love these joojeh kebabs and totally agree with the Persian method of using yogurt in the marinade overnight: makes for the best texture and flavor in my opinion; could eat this meal several times a week with that awesome rice. Is there a recipe for that rice somewhere? It looks amazing. I am making the kabobs tomorrow night. Azita, I absolutely LOVE your blog! I'm an Iranian living in the US and although my mom taught me some cooking when growing up, I'm still discovering new Persian dishes and also cooking more and more of the classics like Joojeh kabob. I tried this recipe last week and have been craving ever since. So now it's again marinating in my fridge for tomorrow! It's DEFINITELY better than restaurant quality kabob. @Goli, thanks so much for your kind words and visiting my blog! I'm glad you enjoyed this recipe. Hi.. love your blog and subscribed to it on my reader! Can I used the same marinade for the chicken, and use it for when I make jeweled rice? I want to cook jeweled rice and add chicken to it. Sabby, thanks so much! Yes, you can serve this grilled chicken with jeweled rice if you like. even though my family and I have never made it with yogurt, (im iranian), this is a southern style I believe, and it makes the chicken very tender and delicious, similar to the way pashtuns make tanoor chicken. yogurt marinade is just awesome, good recepie. Super fantastic flavor! Thank you! I made these with zucchini "cakes" and grilled tomatoes/onions, so much flavor and color! The best and most simple recipe I have yet to find! Thanks! i love Iranian food and make them in my home its so nice to see someone doing such a great job keep it up. I just made a few changes in the recipe and hope this will help you! Please let me know how it goes. First off i want to say i love your blog very much. I'm Persian-American and many of your recipes are similar to my family's. I love your Joojeh Kabab recipe, though i personally prefer to use lemon instead of lime and i sprinkle the kababs with sumac after it's grilled. I'm going to try it with lime soon for a bbq. Jonny, I use lime because it gives a slightly more sour taste to the chicken than lemon. I'm so glad you like my blog. Thank you very much. This looks delicious and simple. Would this work with de-boned chicken thighs? I prefer that to chicken breast. Yes, this recipe will work with bone-in or boneless chicken pieces as well. Thank you. Okay. I've done this a few times now and my chicken is tough. What am I doing wrong? I actually Cuisinart the onion to death. Perhaps that's the issue? Holly, yogurt and olive oil mixture tenderizes the chicken and there’s no need to puree the onion. Just grate an onion by hand and add to the yogurt. Julia, I only allow the chicken to marinate in refrigerator for 6-8 hours and this lime marinade works well with chicken. If I can add something to Holly Aylward. It is possible that you grilled the chicken too long. Chicken breast doesn't need long grilling time. If you keep it too long it will turn dry and tough. Azita, love Indian food...got to try this one soon! I thank you Azita for your Joojeh recipe. 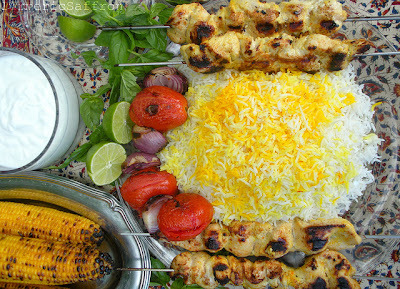 I worked with Iranians and their lunch would always smell heavenly so one day they offered to buy lunch for me and I was sold when I had the grilled chicken with basmati rice. My lips are watering as I think about the aroma alone!! I plan to make a few changes like brown basmati for health reasons but other than that I am off the market!! Many many thanks for this for the other recipe. Looks great. That's a lot of marinade for 2lbs of chicken. I assume you'll have a good bit left over. Is it reusable for another meal the next day? Suspire, I'd like to cover the chicken pieces completely. You can cut the marinade in half if you prefer. I wouldn't reuse it the next day. Thanks for this recipe! I just made this tonight and it was sooooo delicious! I was stuck in a rut with my same-old chicken recipes and then I found this! My hubby ate lots even though he wasn't even hungry. I used the left over marinade to stir fry with rice and it was really tasty. I made this and tried another recipe using the Sadaf seasoning for chicken kabob. This recipe is by far the best! It tastes just like our favorite Persian restaurant that is in another part of our state. Now to get a really great naan recipe that I can make at home and my meal is complete! Thank you so much for such a wonderful recipe and such a beautiful website. You are a gift! I am trying to cook this dish for my persian boyfried. My question is what kind of rice do you cook alongside the kababs? Can I have the recipe for the rice? We pick up kabobs weekly, living in a city with a fair-sized population of Persians makes that easy. The ones' we get have a few more ingredients in them then the recipe given above, though I am guessing by taste and colour--yogourt, lemon juice, turmeric, onion, small amount of garlic, cumin, black pepper and salt. Hi, looks great and simple. If I don't have a grill, can I cook it in over or stove-top and will they taste the same? Sometimes that make a big difference. Thank you. You can cook it in the oven or on the stove-top. It's not the same but it is equally delicious. I just made this and it was so delicious. Such an easy recipe. Thanks for posting the recipe! Joojeh kabab seems very delicious and great. Thanks for sharing. I made this once and it came out overly saffron-tasting. I used spanish saffron strands. Is powdered saffron the same as saffron threads? If not, how much of the saffron strands should I use? Thank you so much. I love yourblog. Erum, powdered saffron is the saffron strands that have been crushed and turned into powder. Use a small pinch of saffron (about 10 strands). 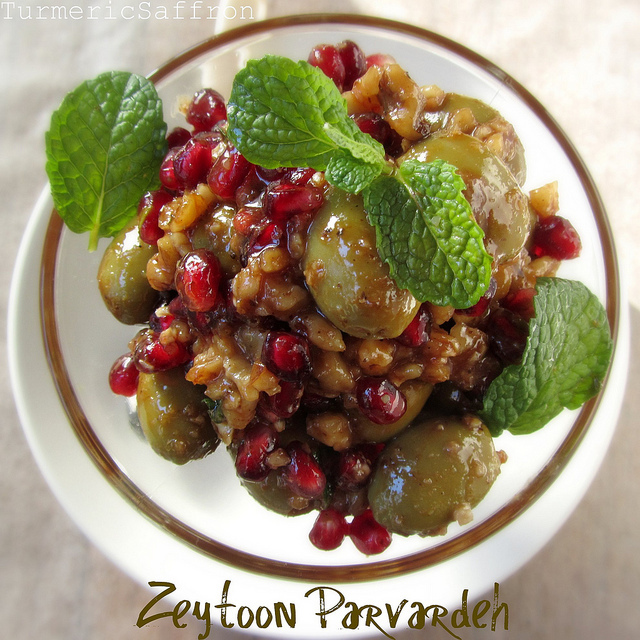 If you are new to this recipe or Persian cooking, please consider the author's sage advice. Err to authenticity and opt for limes over lemons and always invest in fresh citrus versus bottled juice extracts. Another tip is to continue squeezing fresh limes over the kabobs while grilling. Adds moisture to the tenderness of the chicken. These subtle differences migrate the taste from really good to great. I thought the Indians made good chicken. And they do. 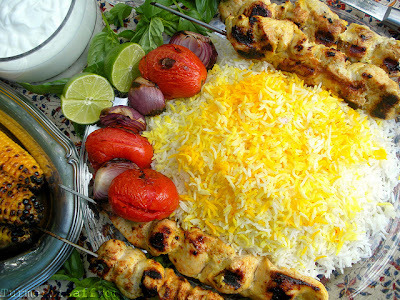 But one of the most memorable chicken dishes, persian lamb kabob I had in recent memory, was at an Iranian restaurant. Can I bake these instead? What temperature and how long would I bake them for? Grilling would be ideal and tastier but in the colder months that is a little difficult. Yes, you can bake them in the oven. Preheat oven to 350 degrees Fahrenheit. Remove chicken from marinade and place in a lightly greased baking dish. You may drizzle a little olive oil on top. Bake for one hour or until chicken is fully cooked. Thanks for this recipe. I made this and the Persian rice for me and my wife tonight and it all came out perfectly. Probably the best kabobs I've ever had! I thought the recipe (and the rice recipe too) was quite easy to follow and implement. Great stuff! !